Leviton Manufacturing Company’s wireless lighting control products were chosen by Consulting-Specifying Engineer (CSE) magazine as one of the Best Products of the Year. The high-performance occupancy sensors combine Leviton’s legendary styling and superior performance features with reliable wireless technology. The result is a “green building product” that offers significant energy-savings and reduced installation costs for both retrofit and new construction applications. CSE Judges selected up to 5 finalists in each of 10 categories, and determined their ranking as gold, silver or bronze. Judges comprised of professional engineers who regularly design and specify HVAC, electrical, fire protection and plumbing systems awarded Leviton a prestigious gold level ranking. “The Product of the Year competition illuminates the products design engineers and specifiers are valuing for MEP systems in nonresidential buildings. In this tough economy, construction and operating budgets are under stress while sustainability issues for energy, water, and materials are growing. Flexibility, modularity, efficiency, and durability seemed to be factors shared by many of this year’s winners,” said Michael Ivanovich, editor-in-chief, CSE, a monthly publication with a circulation of over 46,000 mechanical, electrical, and plumbing (MEP) engineers. 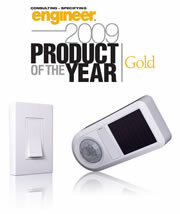 For more information about Leviton Manufacturing Company, visit www.leviton.com.